The Deep Sea Fishermen's Union of the Pacific is proud to share images and video of its members who risk themselves in a pursuit of Halibut and Sablefish in the North Pacific from the Coast of Washington to the Bering Sea and Aleutian Islands. Check out the video below to learn more about bottom longline fishng. Check out the Deep Sea Fishermen’s Union crew aboard the F/V Vansee as they work hard to bring ARTISANAL pacific halibut to the world. Check out the new Deep Sea Fishermen’s Union Building sign installed on November 1st, to commemorate 80 years of proud ownership of its building - the historic Ballard Fishermen’s Building. The sign’s “halibut hook” bracket was custom fabricated by Seattle fishing fleet metal fabricator Chris Anderson as envisioned by Union President Koll Bruce. This photograph was taken of North Pacific Fishery Management Council Advisory Panel members taken at the October 1- 9 Council meeting held in Anchorage. The Deep Sea Fishermen's Union is working hard to protect the interests of fishermen as it advances the interests of crew and the union's interests in a sustainable North Pacific fishery. Offloading Halibut from the F/V City of Seattle with Andrew Ness cutting heads. 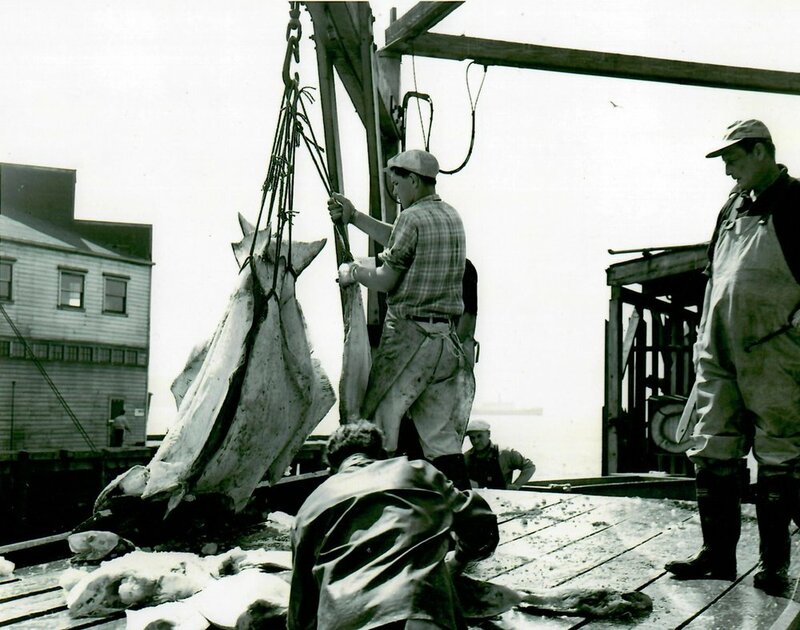 This vessel transitioned from a Halibut to crab boat in 1963 but not before Captain Dave Larson and his brother John purchased the long-line gear from Conrad Ness and the gear was used to outfit the Larson’s boat, the F/V Buddy. Dave Larson fished halibut aboard the Buddy with his brother until Dave went to college in 1967 at Pacific Lutheran University. After college Dave resume fishing and he is featured in an oral history video clip below. The film below was created to commemorate our storied past and long business relationship with the Fishing Vessel Owners Association. At aged 106, the Deep Sea Fishermen's Union of the Pacific looks forward to our next 100 years in existence. The film below was features the role the skippers and crew of commercial Halibut and Sablefish long-liners played in the development of the great North Pacific Fishery.